2015 Turn Up Conference | Turn Up! 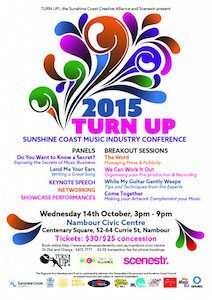 Turn Up, the Sunshine Coast Creative Alliance and Scenestr are calling on musicians and music industry personnel from the Sunshine Coast region and Greater South East Queensland to come together to connect, network, listen, learn and be inspired at the Nambour Civic Centre on Wednesday 14 October for the 2015 Sunshine Coast Music Industry Conference. Now in its second year, Turn Up is fortunate to have received the support of The Regional Arts Development Fund, APRA/AMCOS, the Sunshine Coast Council and the Sunshine Coast Creative Alliance to make this music industry conference happen in the region, meaning that Sunshine Coast musicians and musically minded people don’t have to travel to be able to access music-specific conference content. The Turn Up program offers insights from leading industry achievers through a keynote presentation, two music industry panels and four breakout sessions. Sunshine Coast Mayor, Mark Jamieson and music retailing legend, business book author and motivational speaker, Barry Bull, are excited to be opening and launching the 2015 Turn Up conference. Dennis Dunstan (Front Row Management) will present a keynote speech drawing on over 35 years experience managing such bands as Fleetwood Mac, Stevie Nicks, Men at Work, AirSupply and others. Delegates will be entertained by showcase performances from some of the region’s best contemporary musicians including Anna And Jordan, Fiona O’Shea and Jessie Ryan-Allen. The panels and breakouts are comprised of high profile industry professionals, offering their insights on topics of song writing, music business, guitar, pre-production, publicity, media, artwork, photos and networking. “It’s a really vibrant time for the Sunshine Coast music scene. Our artists are being recognised for their talent and hard work nationally and internationally and are being strongly supported locally by the Sunshine Coast Council, the TAFE East Coast music programs, the Sunshine Coast Creative Alliance and the growing number of venues and events booking live original music. The Turn Up Conference aims to further support this vibrancy by providing an opportunity for music people on the Coast to connect with leading industry achievers without having to travel outside the region and network with other like-minded souls”, Turn Up’s Program Director, Eloise Gallagher, said. When: Wednesday 14 October 2015 from 3:00 pm until 9:00 pm. What: TURN UP! Sunshine Coast Music Industry Conference. Speakers: Mayor Mark Jamieson, CR Greg Rogerson, Peter Koppes (The Church), Dennis Dunstan (Front Row Management), Jeff Chandler (Gympie Music Muster), Stu Boga Fergie (OKA), Tyrone Noonan (George), Phil Emmanuel, Taylor Moss, Owen Van Larkins, Elliot Heinrich (Helliport Studios), Tyler McLoughlan (Sound Pound), BJ Hemmling (Cherry Red), Mel Baxter, Lance Balchin, Howard Duggan (Eyeball Media), David Dean, Barry Bull and Adam Bean. Contributing Organisations: The Regional Arts Development Fund, APRA/AMCOS, Sunshine Coast Council, Sunshine Coast Creative Alliance, Scenestr, TAFE Queensland East Coast, Shake It Up Music, Miss Music Biz, QMusic and Hostile Entertainment.